SYDNEY, Jan. 30, 2019 /PRNewswire/ -- NetComm today announced the launch of its new 5G Fixed Wireless self-installation technology that will super-charge the 5G Fixed Wireless market by enabling network operators to slash the time and cost of connecting customers to ultra-fast broadband. Although Fixed Wireless has been suggested as one of the main drivers of early 5G deployments, its potential has been limited by the fact that some early pre-standard 5G launches have seen operators have to install an external antenna in order to connect customers. The time and cost of connecting equipment at the customer premises threatens to stifle the 5G Fixed Wireless market by making services unprofitable when deploying at large scale. However, the new NetComm 5G self-install platform offers operators a cost-effective plug-and-play model that will massively cut the time and cost of connecting homes and businesses to 5G Fixed Wireless services. 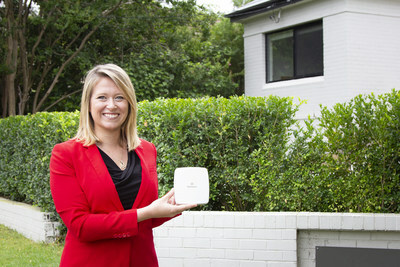 The NetComm 5G self-install platform allows end-users to get the best possible connection via an application on their phone that connects to their new modem and the 5G network and guides the end-user to the best position for their modem to be placed in the house. Because of the varying characteristics of the 5G Fixed Wireless market -- with different spectrum bands and cell sizes being used -- NetComm has developed a portfolio of devices for the marketplace -- all of which support both sub 6GHz bands as well as mmWave. Outdoor wall mount: These devices also use directional antennae to allow for a longer reach and location further away from the base station. NetComm offers both a self-install outdoor wall mount as well one which requires engineer installation. Outdoor roof mount: Installed on the roof and use high quality directional antennas to allow for an extra reach from the base station with good connectivity. "NetComm is delivering the missing piece of the jigsaw that will help enable mass market 5G Fixed Wireless take-up." "No new technology can succeed unless there is an easy way to deploy it and our self-install platform is a game-changer for the economics of 5G Fixed Wireless." "It is great for end-users as they don't have to stay home waiting for a technician to turn up – they can get online in minutes once they have plugged in their hardware." "We have worked to make sure that our 5G Fixed Wireless platform delivers an exceptional connection quality on a level with what end-users have come to expect from fixed-broadband services delivered over fibre or cable." "Our research at Ovum clearly shows that installation costs have a significant impact on the business case for Fixed Wireless access." "In some cases, these installation costs can be prohibitive to Fixed Wireless services actually being launched." "Therefore, new technologies that lower installation costs will help to expand the potential customer footprint for Fixed Wireless and improve scale economics -- helping to build a business case for Fixed Wireless investment."